This small panel is characteristic of many of Bellis’s still life paintings in its use of compositional techniques, colouring and lighting learnt from the masters of the Dutch Golden Age. 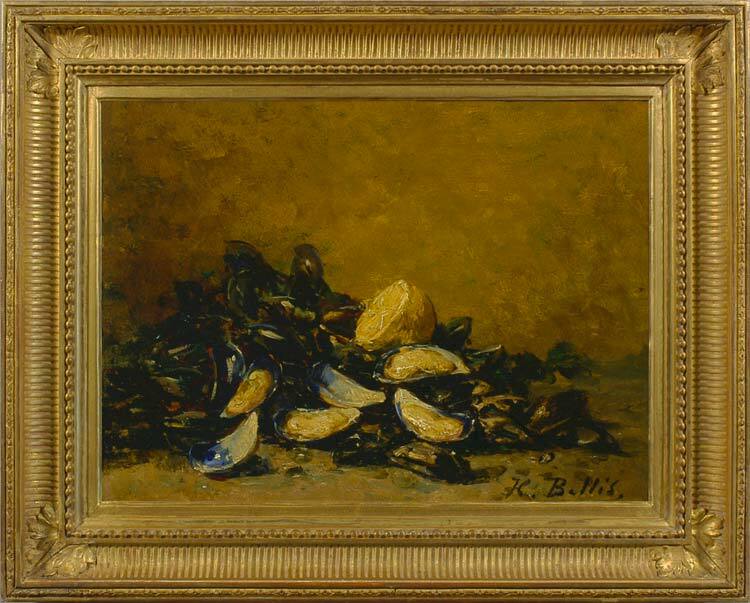 The heaped abundance of mussels, the opalescent interior of the shells contrasted with the blue-black outer, the background rendered in a warm scumble of ochre, chestnut and grey, and the texture of lemon peel beside the glossy shellfish: these are all a contemporary recasting of the great 17th century celebrations of flesh, fruit and flowers. Bellis is noted for his paintings of grapes, pears, apples or strawberries tumbled in profusion on a tabletop; he also produced updated versions of these dining-pieces, with light backgrounds, modern bottles and knives.